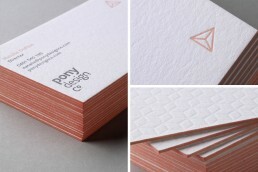 Pony Design Co. is a successful interior design firm based in Sydney. It was a start up when the owner asked us to help build her brand. As with all such projects, we delved under the hood, finding out what she wanted the business to become, who she was targeting and how it should be perceived. 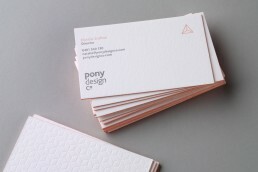 From this information, we developed our creative strategy that would drive the identity and subsequent application. The core mark provides a simple, contemporary type, stacked and supported by a geometric form: this device was developed from understanding how Pony’s work is informed by shape and space, and how integrated form can help deliver a successful, inspiring environment. 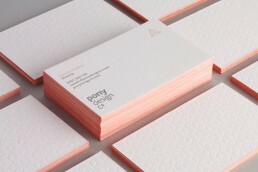 From this we tackled the necessary details of business cards and stationery and rather than opt for the straightforward, we developed and produced card with subtle, tactile embellishments including rolled edge print, to provide this critical piece of communication with the feel appropriate to the business.